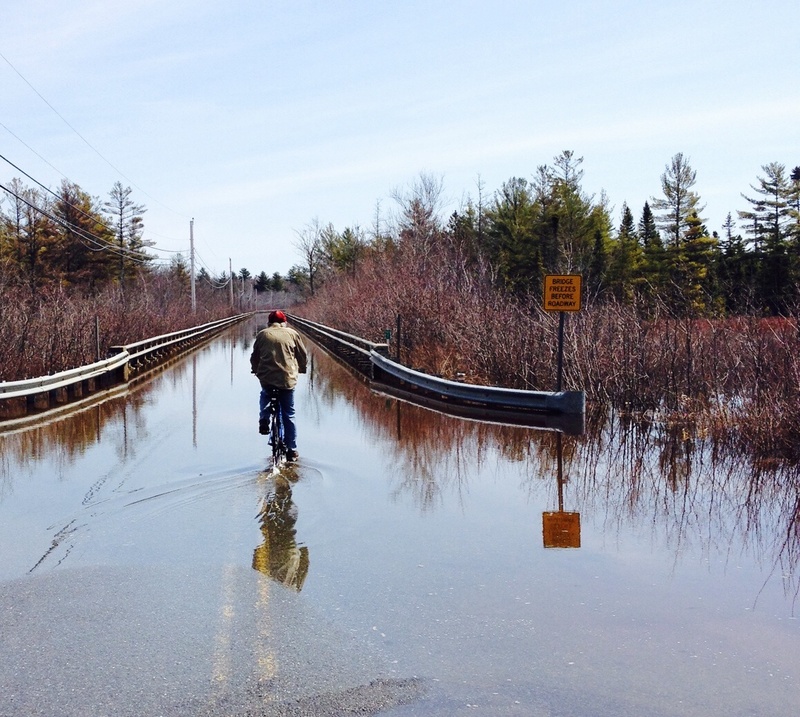 Spring thaws flood the causeway to Pushaw Lake in Maine. Winter in Maine can be long, snowy, and cold. This winter was all that and more. Snow started falling in December and once it did, there was nary a day that our yard was not covered in white, sometimes as deep as two feet or more right up to the middle of April. It did not snow every day (sometimes it seemed like it), but because the temperatures rarely rose above freezing it never got a chance to melt. In fact, it was the second coldest winter on record for the greater Bangor area. Cold winters are to be expected in Maine and that was something we thought about seriously before we made the decision to move to Maine seven years ago. Having spent the first fifty+ years of our lives in Southern California we made a conscious decision to embrace the opportunities that a four season climate would offer. We bought heavy coats, warm boots and woolen hats so that we could learn to enjoy getting out and about in the winter. We took up cross country skiing, found ice creepers that allowed us to walk out on the ice once the lake froze over, bought season tickets for hockey games at the university, and learned techniques to safely drive on the ice and snow. Unlike lots of retired Mainers who head south to warmer climes to wait out the end of winter, we pretty much stay and enjoy the coldest season. What we have discovered over our time in Maine is that the whole four season thing is a myth. There are really five seasons, Spring, Summer, Fall, Winter and MUD! All that snow that falls (and doesn’t melt) over the course of winter does melt with reckless abandon as spring temperatures begin to rise. The ground can only absorb so much and the woods, fields, waterfront and dirt roads become wet, muddy, and just plain messy. Ugly in fact. The arrival and length of mud season varies from year to year and , as you can imagine, can be hard to predict very far in advance. All I can tell you is that it didn’t take very long for us, or more accurately me, to decide that mud season is the perfect time to see what the states south of New England have to offer. So that is where we find ourselves today …in our camper van headed south on Interstate 95 for a three week camping trip that will start in South Carolina, through Virginia, on to Maryland, and ending in Delaware before we head back to Maine. When we arrive home, with any luck the water will have receded, the tulips and daffodils will be in bloom, and the lawn will once again be the beautiful dark green that begs to be mowed weekly. And Mud Season will be over for another year. This entry was tagged four seasons, Maine winters, mud season, snow melt, snowbirds, winter. Bookmark the permalink.